Just like most global enterprises, MAN used to have an enormous Style Guide, compiled into over 500 pages of PDF's. While including guidelines for all different MAN communication channels – finding the right definitions was complicated, and its usability was far from adequate. This changed instantly, as they moved their brand manual into the cloud, discovering a world of reusable code snippets and centralized brand design. We met up with Robert Bihr and Manfred Schurer, to talk about how they in 2016 comfortably relaunched their digital channels with the help of Frontify. While keeping their pain points in mind – they aspired to provide their global teams, located in over 60 different countries, with a centralized online software in which they could cut through the previous hurdles, and work collaboratively online. "As we aim to stay market leaders in our industry, we understand that upholding a high brand appearance is essential. The starting point for us in building a stronger brand was to give our global teams access to all of our brand material in one place – providing them with the ability to be their best selves – ultimately working comfortably at a faster and more qualitative scale." All graphic designers and developers in the MAN organization previously managed different versions and updates of their concepts and design locally, which later ended up in everlasting email threads. Such a creation process could quickly generate frustration in any design iteration, as it's both time- consuming and hard to maintain. Getting everyone on the same page was vital for the relaunch of the new global website to be successful. By using an online software like Frontify, all co-workers and external partners were quickly set up and presented with the cloud-based brand material, allowing the entire organization to work together, while keeping a structured project overview. In Frontify, developers could create reusable UI Patterns based on atomic design, and designers began transferring their work into the Style Guide – completely revamping MAN's readiness – allowing them to profit from quicker roll-outs. 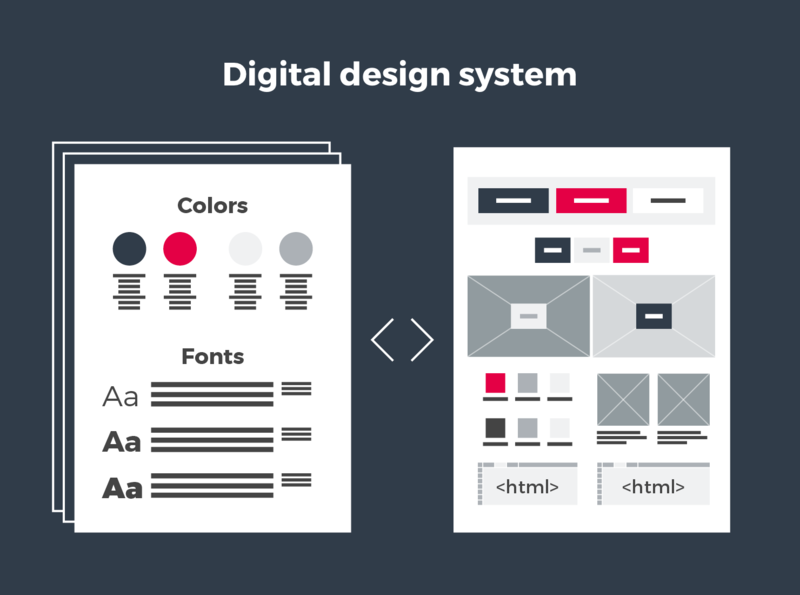 By marrying the corporate design definitions with a living UI Pattern Library, connecting several departments, MAN could massively reduce their time cost for the entire design-to-development workflow. As the relaunch of the global website neared completion – supported by collaborative work through team based design iterations and prototyping, utilizing the connection of all designers and developers; their new digital design system became the centralized place for all brand visuals and code. "Frontify has helped us immensely. The way that we're now able to conduct project management, involving anyone related to design or web development with just a click, streamlines the entire process. We can now work faster, more efficient, and most importantly; together. 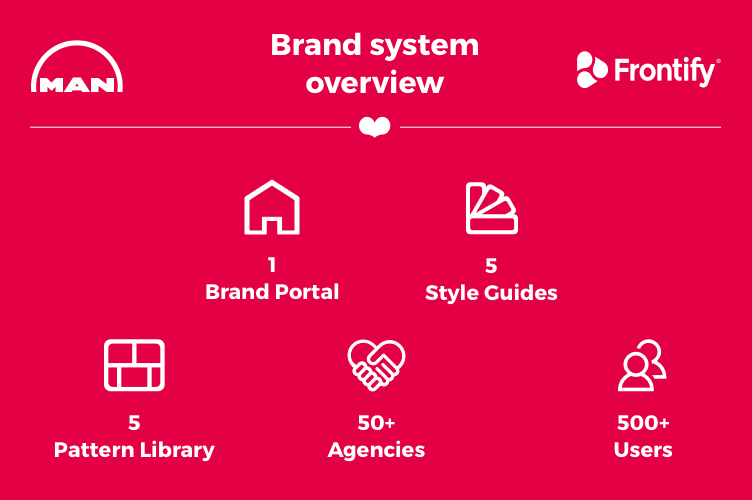 As a result of its success, we've now started to move additional sub-brands into Frontify." Today, as they’ve created a space for all of their brand material, the enhanced access to brand content and code allows MAN to save an enormous amount of effort. 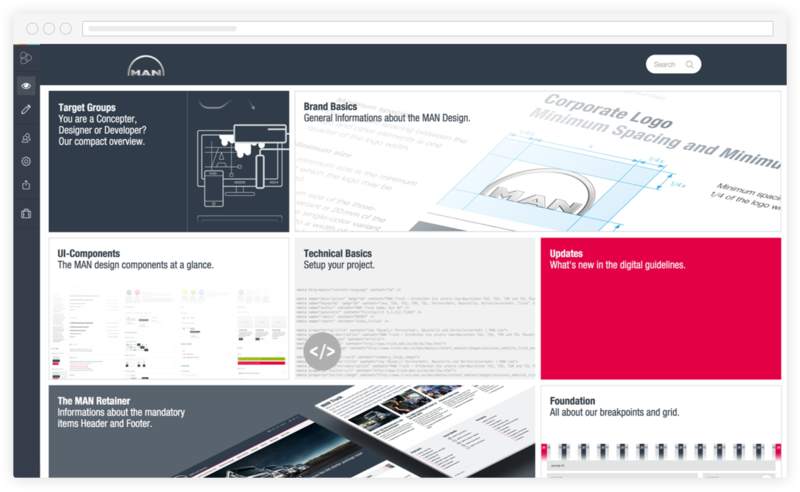 Incorporating over 500 users and 50 external partners, generating over 100 projects yearly; the cloud based brand guidelines permitted MAN to vastly improve their CI, staying consistent throughout their global markets, while saving time and money in the process.